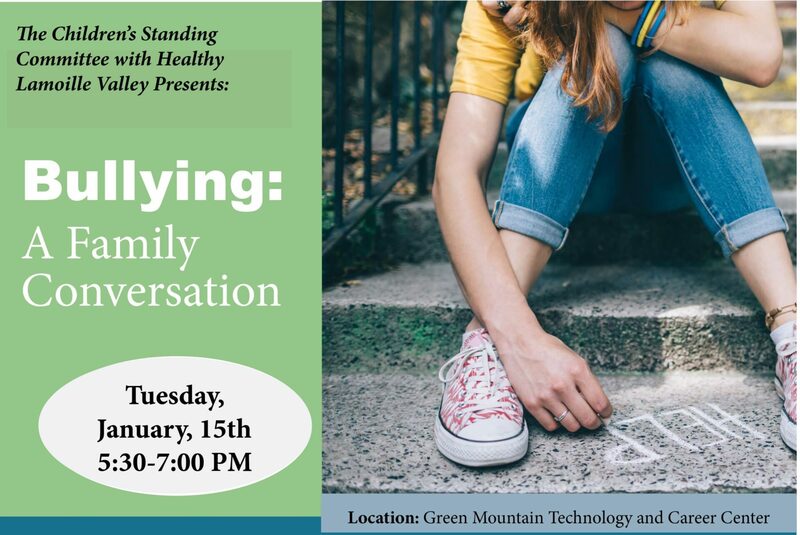 Bullying: A Family Discussion – Materials Follow-up! On January 15th many in our community came together around the topic of bullying. We wanted to share the resources and contact information mentioned at this event. All of our panelists are happy to be ongoing resources for you and would welcome your messages. Green Mountain Public Access TV recorded the event. Once we have that link we will post it here. One of the common themes throughout the evening was relationship. While strong relationships will not always prevent bullying they do provide opportunity to address bullying. Taking time each day with your children/teens will create a foundation that will allow them to come to you when they need help. Bullying is a series of traumatic events in the life of an individual. We as helping adults need to address it as trauma. We know that a trusted caring relationship can reverse the negative impacts of trauma. Heather Hobart shared that it’s not always helpful or appropriate to have the youth that is being bullied face their bully. This is a harmful practice that in many cases causes more trauma. Much restorative work needs to be done before this can be a helpful interaction, and in some cases it is never appropriate. Click here to download the Lamoille Restorative Center handout on restorative practices. Please contact us if we can help! Prevention: Teach kids how to identify bullying and how to stand up to it safely. Tips for building relationships and having difficult relationships with your teens. A musical that can be done in schools, written in part by Elmore resident, Jon Gailmor. You can listen to the songs, and rent the musical at the TAMS website and at the Bully No More!website www.bullynomoremusical.com. You can also email bullynomore.musical@gmail.com and watch on Youtube. Nancy Riestenberg writes warmly and with long experience about the challenges facing school communities and how restorative measures­-specifically Circles­-create a safer space for learning and development for all. Published by Living Justice Press. Restorative questions are a tool used to process an incident of wrongdoing or conflict. The questions focus on the incident, and allow the person to think about how his/her actions affected others. It encourages empathy, accountability, expression of feelings and thoughts, and problem solving. Restorative questions are also answered by those who were impacted by the incident, to help them process their feelings and determine what they need to make things right. Read more on the International Institute for Restorative Practices (IIRP) website. for their policies, prevention and response plans.